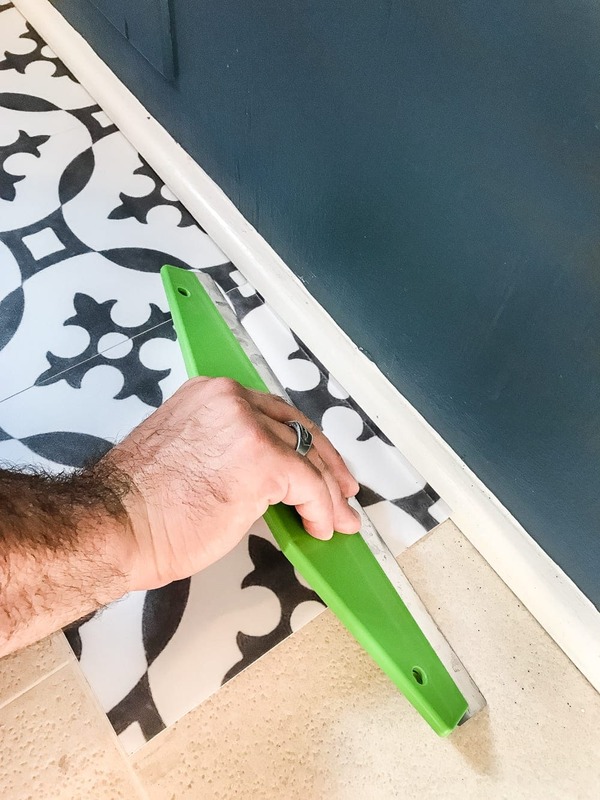 A DIY tutorial for how to install moroccan peel & stick vinyl tiles. Less messy than paint. Less time-consuming and less expensive than real tile! Anyways, I’m losing my train of thought over here. Back a couple of months ago when I was dreaming all-things-laundry-room, I mentioned how I hoped to paint our gross vinyl floor. We painted the walls, we painted the cabinets, we painted the ceiling and the trim. If you stand still in this room long enough, I will paint you. I’ve heard of so many rockstar DIYers having success painting vinyl floors with those pretty Moroccan style stencils, and I figured I’d take a stab at it. 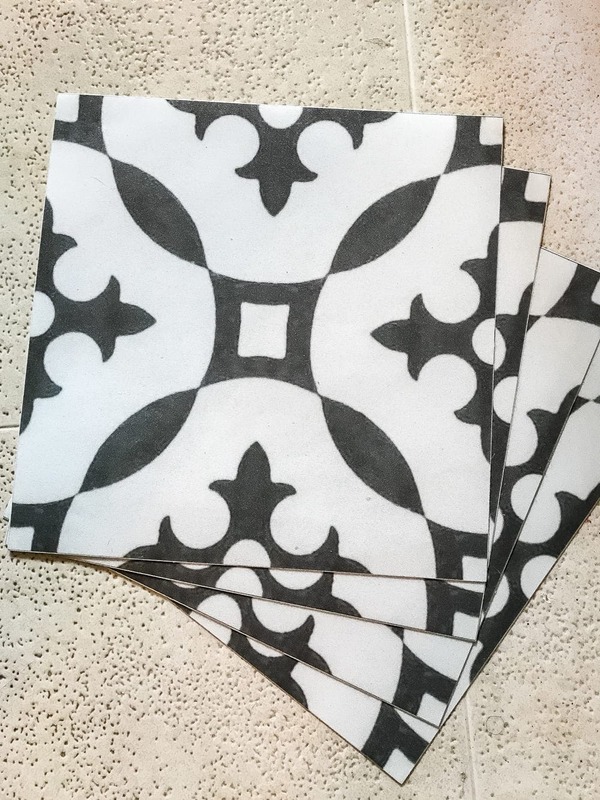 Buuuuut then I found a less messy, less smelly, less time-consuming (hopefully more durable) solution that I’m loving even more- vinyl Moroccan tile. Yassss! 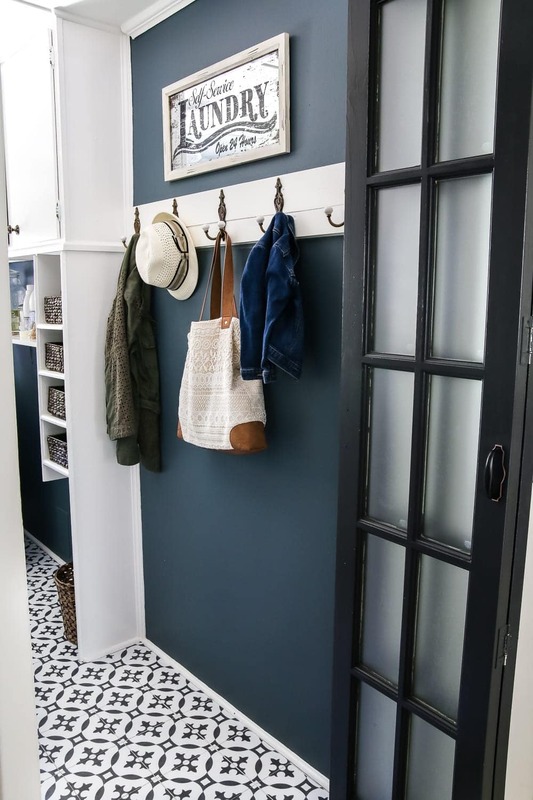 I debated a lot (and even shared a whole slew of my faves), but I landed on a clean black and white pattern to add some va-va-voom… and also help hide any dirt we traipse in here since this room is our big workhorse of the house. Here’s how the floor started. We’re hoping in a few years we can do more of a Phase 2 renovation where we rip out the 1960s cabinets, reconfigure them to create better flow in this space, and add real tile in here. But for now, we’re cool with a quick cosmetic fix. So here’s the skinny on how we installed the vinyl tiles. To make sure we started with a totally clean slate, I swept the old vinyl floor first and scrubbed them with the Krud Kutter TSP. Then, let dry. We started installing the tiles in the spot that would go underneath the washer and dryer so we could get the hang of it. Since the old vinyl flooring already had straight lines on it, we were able to use that as a guide to keep the vinyl tiles straight. 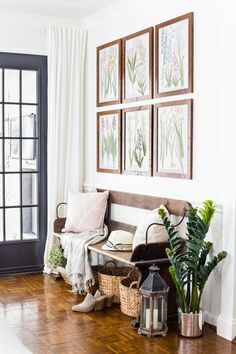 If you don’t have lines on existing vinyl to help you though, use a chalk line to create a starting point since walls aren’t always completely straight. 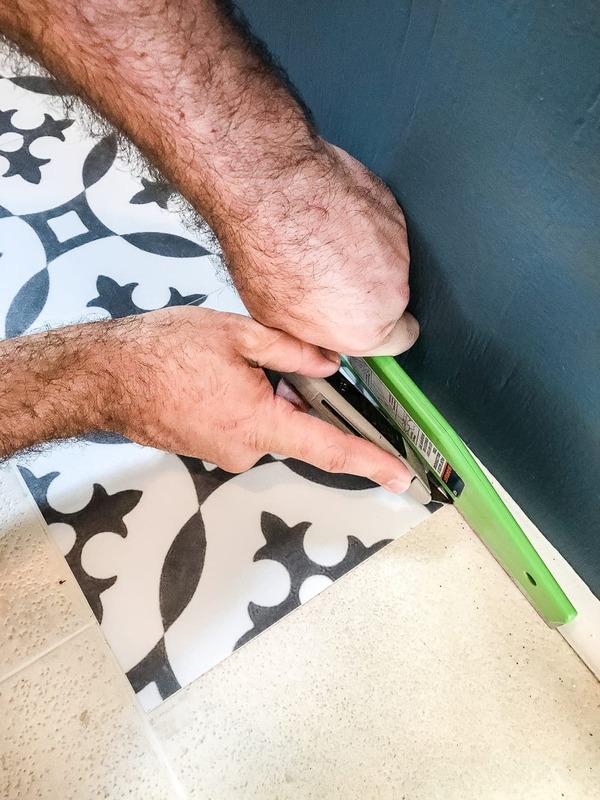 Just peel the backing, lay it straight, and smooth it out with the wallpaper smoother tool. We didn’t run into any issues at all with bubbling, so the wallpaper smoother tool might have even been overkill. Good to be thorough though. 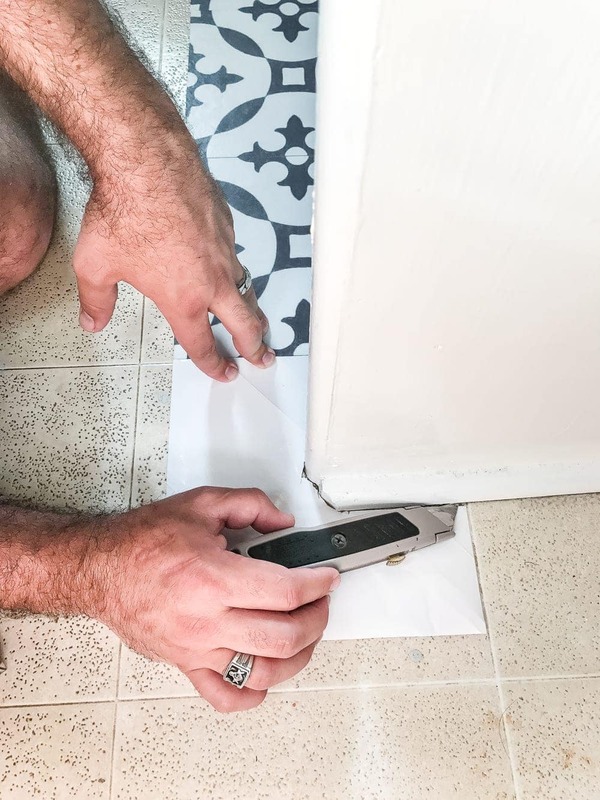 When we got to tricky spots where we had to trim the pieces, we just folded the tile where we needed it to crease and used a utility knife to cut it. For really complicated obstacles, we used a piece of paper backing as a template to trace with pencil and trim the tile. The whole process took just a couple of hours as opposed to a couple of days like painting the floors would have been. The floor ended up not being 100% perfect. Some of the patterns didn’t fully align by a millimeter or two, and we left about a 1/8″ gap between the tiles to make it appear to have grout. But anything was an improvement from the icky floor before. After 24 hours of allowing the adhesive to cure, they can be mopped and walked on. 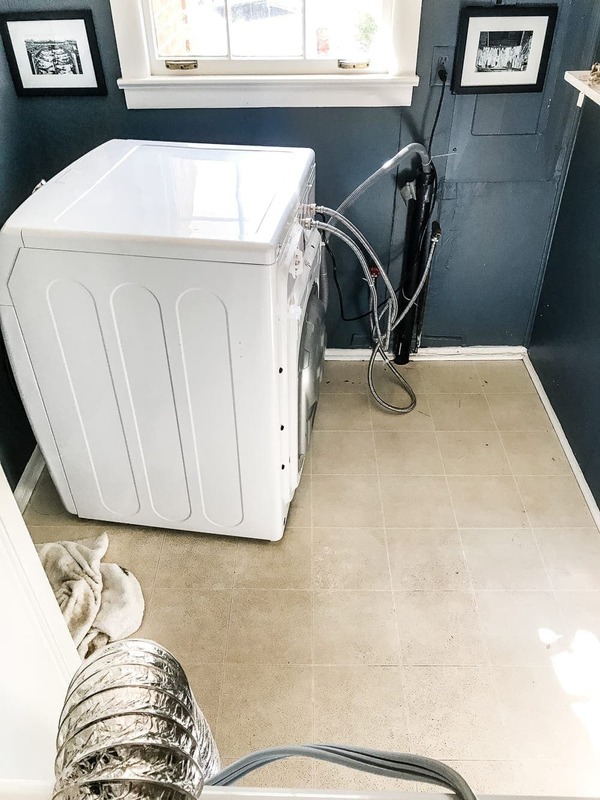 Once we were finished, we had to scoot the washer and dryer across the floor and not a single tile budged! We’ve been in and out of this room for nearly two weeks now, and it’s held up perfectly so far. I’m SO amazed how they turned out! If we ever get tired of the pattern, it won’t be nearly as difficult to change up as laying real Moroccan cement tile would have been. I don’t see us replacing them for a very long time though. I still have some organizing solutions to figure out in here along with swapping out the florescent light, but we’re very close to calling this space finished! Have you ever used these vinyl peel and stick tiles before? Or ones like them? Did they hold up okay in the long run? I’m sure I’ll report back in about 6 months with a final verdict of their durability. Crossing my fingers and toes over here! 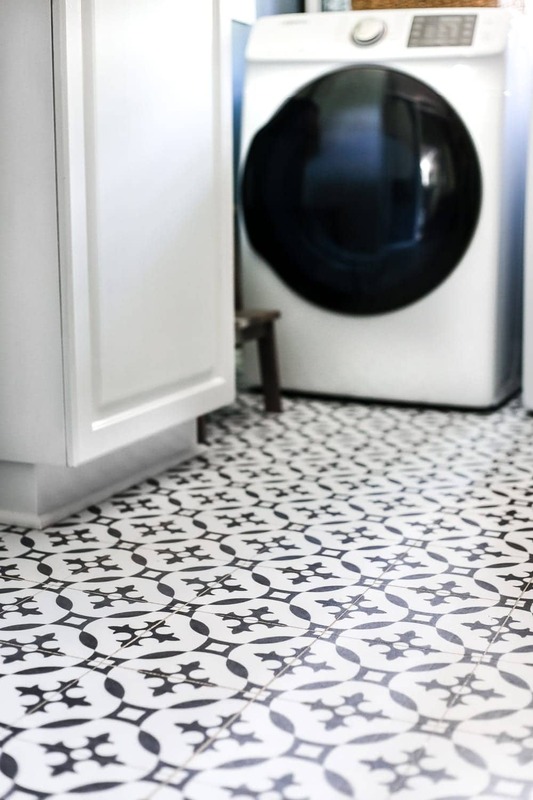 I really liked this DIY Moroccan vinyl tile. It’s awesome. You did a wonderful job. Hi! 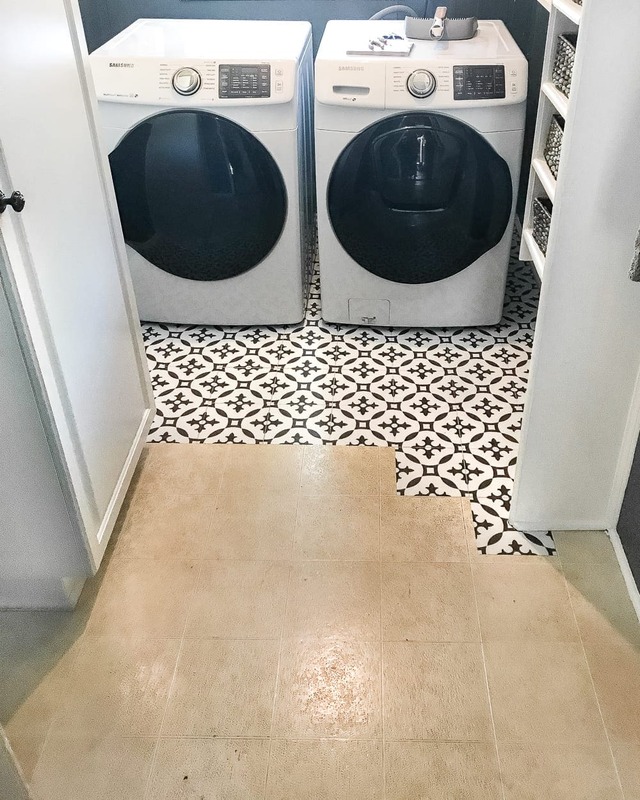 I am sure you probably already know this, but just to be sure…..in my old house, I used peel and stick tile with grout that was made for that type of flooring. I bought it at Lowe’s. It is a more flexible grout that can bend with the movement of the tile. It is premixed, ready to go from the bucket. Just wanted to make sure you knew in case you wanted to add grout to you 1/8″ spaces! Have fun watching the eclipse! Thanks for the tip, Melissa! I don’t think these tiles are groutable. I might try to test it out since I have a few extras leftover just to see how it does. Great post! Thank you for sharing! I would love to use this in our first floor bathroom, but have been a little unsure. Thank you for the step by step tutorial. I love it!!! Our laundry room floor has been bugging me. It doesn’t match the rest of the house. Our budget isn’t quite ready for new flooring so this might be perfect! Looks great Lauren! I don’t have any vinyl floors sooo I think I will put some under the kitchen sink. That would look cute and give me some practice! Lol! So many cute patterns. Thanks for sharing. You guys always do a great job. I think your hubby should be for hire! Lol! Blessings ?????? I used peel and stick floor tiles in my bathroom several years ago. They held up for about two years, before they started to peel. This was okay with me, because it was only meant to be a temporary fix, until we got “real” floors put in. I would save any extra tile you have, you may need to replace one or two in high traffic areas down the line. Oh – pro tip – I also used them in the bottom of a cabinet that holds cleaning supplies, and in one that holds shoes. They’ve worked great there as a really tough shelf liner! 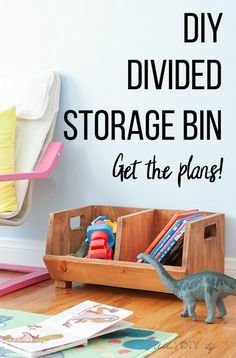 What a great idea to put them in the bottom of a cabinet. Going on my list! Gorgeous!! do you think the small gap between the tiles will become a problem as far as dirt getting stuck in the gaps? Or are the tiles thin enough that mopping cleans them just fine? You’re entire house is AWESOME!!! Wow! The floor looks awesome and what a quick fix. Love it! Wowow!! That is just lovely!! 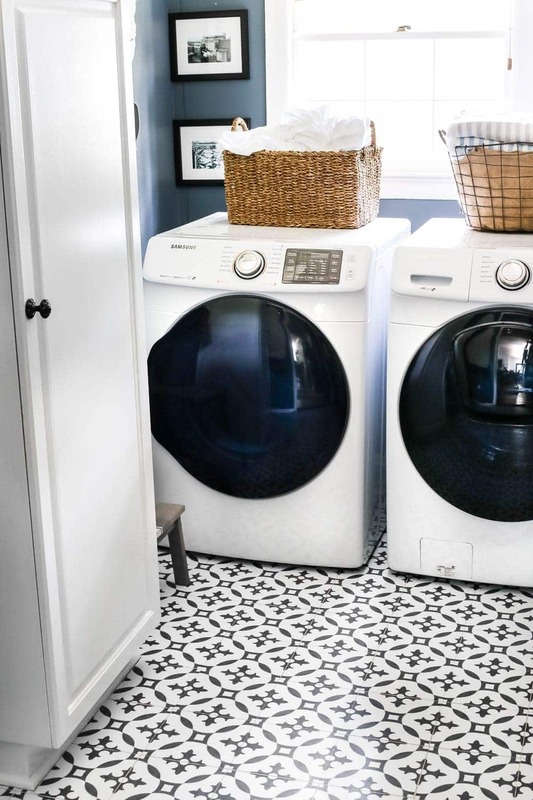 I think I want to copy you in my own laundry room, but I’m curious, are you concerned about being able to clean the 1/8″ spaces? Do you plan to add anything to even it out? Just asking because with four kids, grunge is my reality! This looks awesome! We’ve used peel and stick vinyl tiles before in a utility room, but they were thicker than what these seem to be. Is it more like a contact paper? Also, do you think it would work over real tile? It may be a great solution for a cracked tile floor we have in our powder room. Thanks for sharing! Looks fantastic!! Did you fill in the grout lines with anything – I would be concerned about dust and dirt collecting in those 1/8″ gaps! Love the pattern! More neutral than I thought. 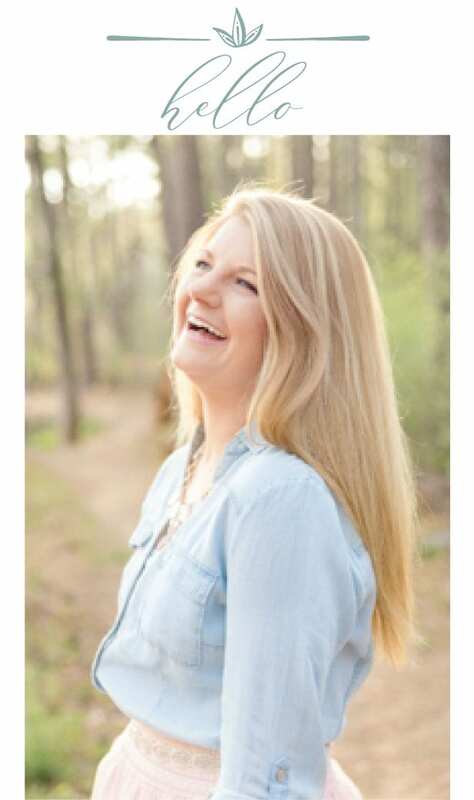 I love the final result, Lauren! They are gorgeous. ? I am wondering if the grout gaps would be a dirt magnet? Would a vacuum be able to get any dirt there? I love your choice of flooring! So perfect and fresh looking! Do you know if I could use these as a backsplash between the counter and upper cabinets in my laundry room? Do you know if they would stick okay to a vertical surface? Absolutely! They actually have ones meant specifically for backsplashes. We just bought the floor rated kind so they’d be extra durable. WOW! I just love them! Great job! 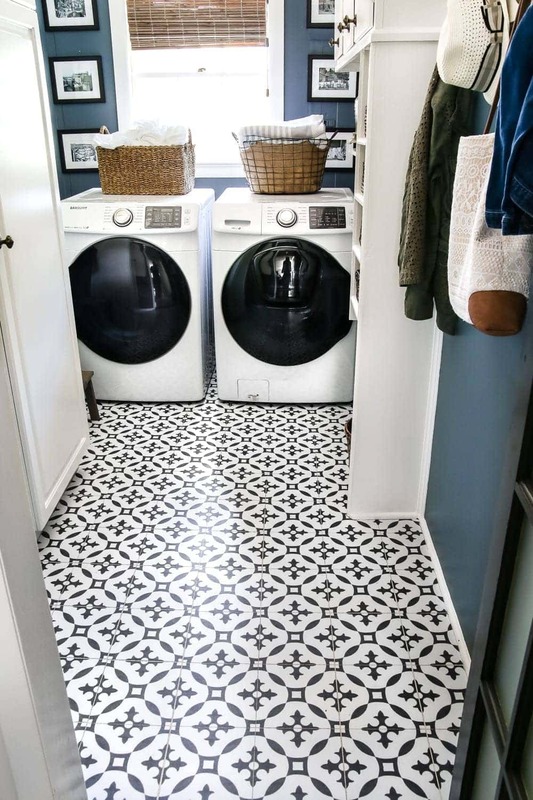 I’ve used peel & stick floor tiles ( a marble look) twice in laundry areas. The first time, I was so very pleased that when we moved, I used the same product again. And it was a disaster! Glue oozed out from between the tiles and got filthy, and when I scrubbed the lines with a glue remover product to clean, even more came out! I think I got a defective batch. My big box store was unhelpful ( they said there was no return on an already installed product if I pulled it out) and told me to contact the manufacturer who also was not helpful since it had been installed! Pulling it out was horrible, as well. I would be afraid to use peel & stick tiles again from my one bad experience! Beautiful! 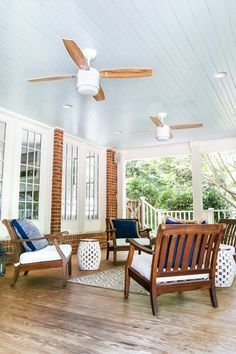 what is the paint color? I’d love that for my study. I don’t see you wanting to replace them for a very long time either. They are gorgeous and take the room to a whole other level! I ordered direct from Quadrostyle for bathroom floor. It was a disaster. So hard to work with and line up. This was even before I got to the tricky area around the toilet. Tried to return one unused packet of tiles and no response from my emails. I’m so glad yours turned out. I ended up painting my floor to look like layers of paint over old wood. Love it. $200 life lesson. Could have been worse. Peel & stick tiles are, of course, meant to be a temporary fix. 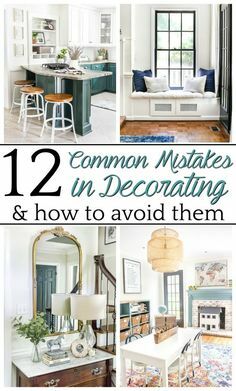 Many do these when selling a home to give a quick face lift. They are ugly to take off, especially because most do what you did, lay them over existing floors. I would say that without grouting them, you will definitely have more peel ups happen a bit quicker, but you know all this and are using them as a temporary fix. I like the “calm” sand color you had in there, but these tiles make more of a statement. Glad they worked well for you! The new floor looks great! Originally, we were going to replace the fake wood sheet vinyl floor at our mountain cottage with hardwood, but we would have to rip up plywood on the whole house. (there’s 2 layers of plywood). We’ve seen some amazing vinyl plank flooring that looks like wood, which would eliminate the need to rip up the plywood and I think that’s the way we’re headed. Love the pattern of the vinyl you picked out. I love the look of your new floor! The Moroccan tile pattern is so good looking! Thanx for sharing! WOW! What a huge difference that makes – whew! 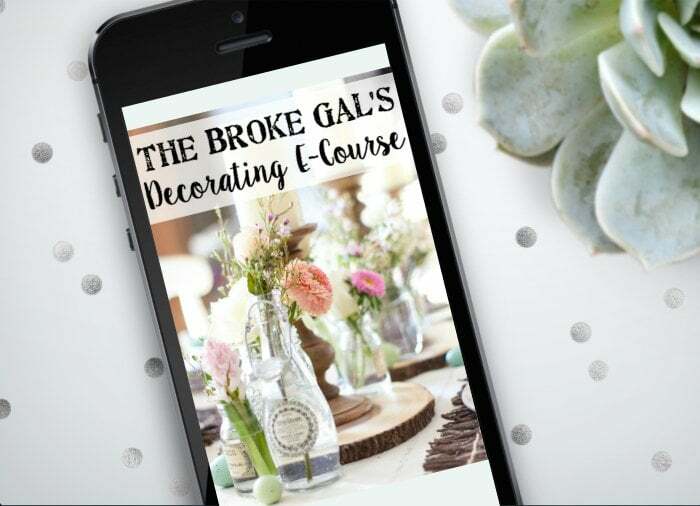 I was worried about the tiles you picked thinking it would overwhelm the space – but it’s done the opposite – the room looks BIGGER now – bright, clean, new, updated – it looks absolutely fabulous. I love the French Bifold Door! It really brings the room together. Not only does the room look clean and beautiful, but it also gives an elegant style to it too! 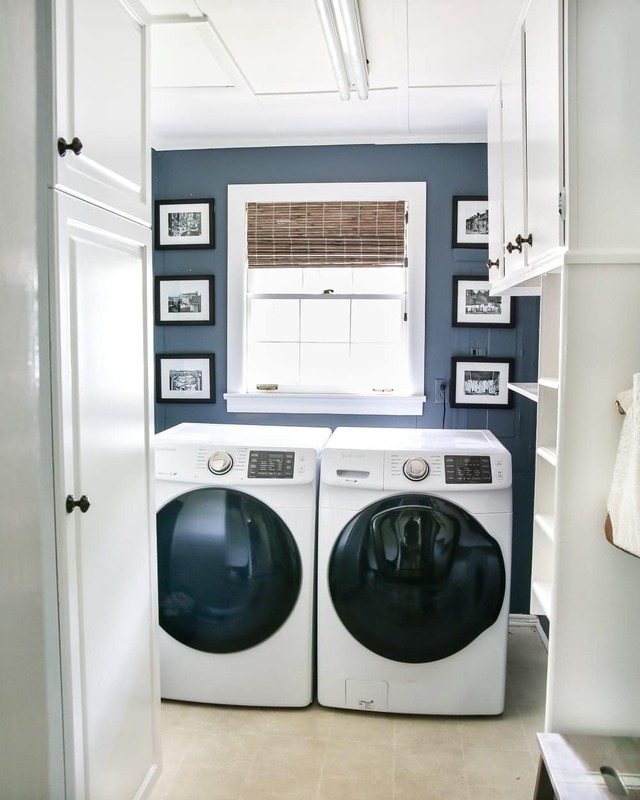 I am totally amazed by your laundry room make over! It has definitely motivated me to try my hand at sprucing my room up! It is a boring white….we purchased white cabinets to provide additional storage and the appliances are white. I would like to paint the walls – there are no windows. I loved the blue you used but I think that would be too dark for the room. Any suggestions on wall color? I want it to be bright and cheerful. Lord only knows I spend enough time in there. LOL! And I am definitely going to copy your idea of the clothesline art!!! I LOVE IT!! Thank you for inspiring me! It looks beautiful, you’ve given me some ideas, thanks! I LOVE, LOVE, LOVE that new floor! What a wonderful difference. Thanks so much for sharing the pictures and tutorial. Beautiful.. Great job.. Proud it turned out so well. Love the black/white with the blue walls..
Looks great. Where did you get the tile? I wonder instead of painting ceramic tile if you could stick these directly to the tiles? 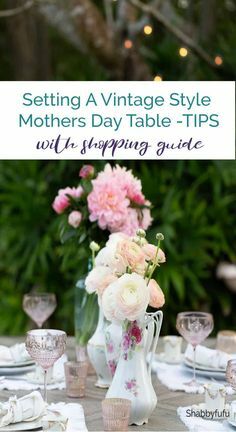 Probably not but would be a lot lot easier than hand stenciling the darn things! LOL I love the look! That’s exactly why I used these instead of painting. Paint would have been cheaper, but way messier, much more time consuming, and I’m still skeptical if paint would stand up in durability. When my husband and I laid down new flooring with the self-stick vinyl tiles we used a wooden rolling pin that I already had to work out any air bubbles from under the tiles instead of purchasing another tool. Not only did the rolling pin help with air bubbles it also allowed us to apply extra pressure in a more universal way across the tiles which helped to adhere them to the floor better. Thanks for this. I’m gonna share this to my fb. Curious how these have held up? So far perfectly! And we’re definitely not easy on them. Lauren, I have looked everywhere for vinyl tiles similar to the ones you’ve used. Where did you purchase? Thanks! Etsy, the link is in the post for the exact tiles. I this this!!! We did some marble looking tiles in Tomas yer back bath. My question is what didn’t you do at the threshold? That threshold piece is raised and a weird shape and the vinyl wouldn’t stick to it without peeling up. I wanted to though! Thankfully, all of this is just temporary. Did it take long on the shipping to get the tiles? I’m considering this option but have a quick turn around? Hi Ashley! I believe it took about 7-10 days to get them in, so it wasn’t all that quick. But that might have just been my particular seller. You could check Etsy for others that have faster shipping. Hi, Devan!! How did I miss that?!? THANK YOU for sharing! !